India vs New Zealand, 3rd ODI: Live scores: Virat Kohli will be aiming to seal the five-match series when his team square off against a confused New Zealand in the third ODI on Monday. 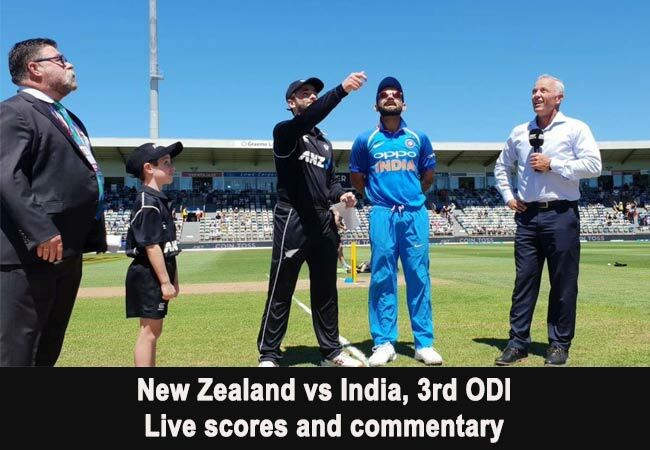 New Zealand skipper Kane Williamson wins toss, opts to bat in their must-win fixture. Meanwhile, Hardik Pandya returns to the Indian squad and MS Dhoni has been rested due to a hamstring issue. In the second over. bowled by Shami, Munro edges one to the keeper, but it was a tough opportunity, DK dives to his left but cannot get his hand on the ball, ONE. ONE. Shami bowls another full delivery, well wide off and a tempted Munro goes after that but ends up nicking an easy catch to Rohit Sharma at first slip. After three slow overs. Bhuvi pulls off a stunner to dismiss Martin Guptill on the very first ball of the seventh over.